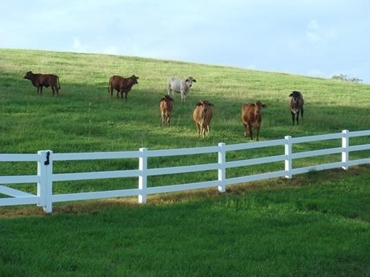 Don Brand Fences and Gates provides PVC fencing solutions for domestic, commercial and farming applications. PVC fencing systems are affordable and low in maintenance. PVC fencing products does not require paint, never rusts or rots, crack, chip, split or be affected by termites, white ants and other various insects. They are safe for horses and livestock and can be combined with an electric fence. Don Brand Fences and Gates has PVC fencing products available in pickets, privacy screen, ranch styles (1 – 4 rails choices) or panels with lattice. Don Brand Fences and Gates also supplies other ranges in fencing solutions from aluminium pool fencing, colorbond fencing, timber, wiremesh and chainwire security fencing systems.